It's Friday and the weather here in southern California is sunny and warm, finally! On this day, associated with the Goddess of love and beauty, I have used the Randomizer to select a winner of the Cimbalom giveaway. The winner mentioned she would like to try Chaparral, her name is Margaret. Congratulations to Margaret who has won a Cimbalom mini solid sample and many thanks to everyone who stopped by to enter. Over at Perfume Smellin' Things stay tuned on Sunday when Beth will be revealing the winner of her tangent giveaway for a Cimbalom liquid and solid sample. 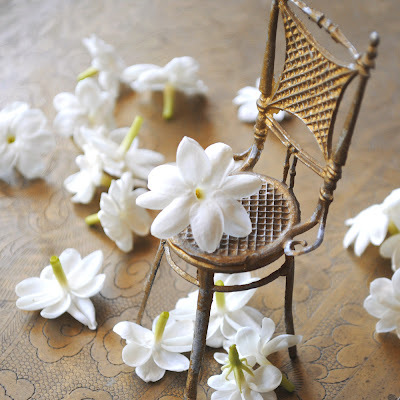 Image: Photo of jasmine sambac flowers from my garden, these were used for a tincture featured in Cimbalom liquid perfume.